I will continually update these rankings throughout the off-season to reflect changes in free agency, defensive schemes, defensive playing time, rookie draft selections, etc. Linebackers are undoubtedly the staples of a fantasy defense. However, I believe many owners often times misjudge value at this position. There are a plethora of LB1 potential linebackers (Cushing, Butler, Timmons, etc.) that can be had many rounds after the Tier 1 and even Tier 2 linebackers are off the board. With this said, the best strategy this season is to wait until the top 5-10 linebackers have been taken and then come in and start plucking up the aforementioned LB1 upside linebackers that are sitting in the 15-20 range. In addition, IDP studs always emerge at the linebacker position during the early part of the season (e.g. Colin McCarthy, Sean Lee, Pat Angerer, Daryl Washington, James Anderson, etc.). With this being said, it makes more sense to go with high upside, boom/bust linebackers in the later rounds as opposed to playing it safe with high floor, low ceiling players. If the risky play doesn't work out, you can always turn to the waiver wire to possibly scoop up an early season linebacker stud. 1. MLB D'Qwell Jackson (CLE) – Jackson just signed a long-term deal with the Browns this off-season. He's the center of Cleveland's defense and is the best pure tackle producer in the league when healthy. 2. RILB Patrick Willis (SF) - Willis has been the #1 LB taken off the board in most leagues over the last couple of years, but his value has dropped slightly with the emergence of up and coming stud Navarro Bowman. He's still a clear cut LB1 however and a good bet for 95-105 solos per year. 3. MLB James Laurinaitis (STL) – Laurinaitis had the best fantasy season of his young career in 2011 with 142 total tackles. He's averaged 103 solo tackles and a couple sacks a year over his first three seasons and has shown no signs of slowing down. He lays outside the top 3 due to the historical lack of assisted tackles issued by the Rams scorekeeper over the last several straight seasons. 4. RILB Derrick Johnson (KC) – Johnson was a fantasy darling of many owners upon entering the league in 2005. However, he quickly fall out of fashion with the Kansas City coaching staff and found himself on the bench while mediocre fill-ins such as Demorrio Williams received a bulk of the snaps. That all changed in 2010 when Johnson launched himself back into the starting lineup and became the leader of the KC defense. He was even better in 2011 and deserves to be a top 5-10 pick in most fantasy formats come this season. 6. RILB Daryl Washington (ARI) – Washington really came into his own last season especially towards the end of the year. Look for his numbers to continue to trend upwards as Ray Horton builds his defense around this talented ILB out of TCU. Look for 100+ solos next season. 7. LILB Navarro Bowman (SF) – Bowman's 2011 numbers were a surprise even to those who follow the defensive side very of football quite closely. He was regarded as an above average run-stopping LB coming out of Penn State, but playing next to arguably the best fantasy LB in the game seemed that it would put a severe damper on his production. Well that thinking turned out to be dead wrong as Bowman actually outpaced Willis' production last year. With this said, be careful not to overvalue Bowman based on his 2011 numbers. A healthy Patrick Willis will likely carve into Bowman's production a bit. He's still well worth a top 10 pick, however. 8. 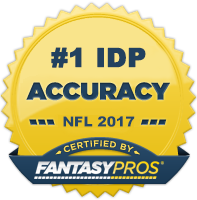 MLB London Fletcher-Baker (WAS) – LFB is perhaps the most consistent IDP in the history of fantasy football and actually had one of the best years of his career from a pure production standpoint last season at the age of 36. With this said, he did start to show signs of slowing down and I expect his production to be curtailed a bit as Perry Riley continues to emerge as an IDP presence on the strong side. 9. WILB Ray Lewis (BAL) – Along with London Fletcher, Lewis has established himself as one of the most consistent year-to-year fantasy linebackers in the game. Extremely well conditioned and motivated, Lewis' tackle numbers continue to remain well above average even at his advanced age of 36. This year may be his last in the NFL, so look for him to go out with a bang. 10. WLB Sean Weatherspoon (ATL) – The departure of Curtis Lofton to New Orleans means that Weatherspoon becomes the main focus point of the Falcons defense. Expect his tackle production to rise a bit as Lofa Tatupu is less of a threat to steal tackles than Lofton was in previous seasons. 12. RILB Sean Lee (DAL) – Lee was well on his way to one of the better fantasy seasons by a linebacker before breaking his wrist in Week 8 of the regular season. He only missed one game due to that injury but it severely impacted his play the rest of the year. Being fully healthy and having a full year of experience in Rob Ryan's complex scheme should allow Lee's production to continue to trend upwards. His added big play potential secures his spot in the top 10. 13. SLB Chad Greenway (MIN) – Greenway set a career high in total tackles last season with 152. This was in large part due to him registering a whopping 64 assists. With this said, this ranking assumes your league rewards for assists and that is where a substantial portion of his points are generated. If not, he's more in the 20-25 range. 18. MLB Paul Posluszny (JAX) – One of the best pure tacklers in the game, Posluszny was expected to put up LB1 type numbers last season upon arriving in his new home of Jacksonville. However, he admitted up producing more like an LB2 in 2011. The decline in tackles can mostly be attributed to poor tackle opportunity (especially during the 1st half of the season). Expect Poz's numbers to return to the 90 solo tackle range assuming he can stay healthy for a full 16 game season. 19. MLB Jon Beason (CAR) – If not for suffering an ACL injury early last season, Beason would be a top 10 fantasy selection at his position in 2012. The strong play of James Anderson on the strong side and the addition of 1st round draft selection Luke Kuechly on the weak side definitely diminishes Beason's value, but he seems fully recovered from his injury and is an elite enough linebacker to still have top 15 upside. 20. MLB Stephen Tulloch (DET) – To be perfectly honest, Tulloch peformed better than I thought he would last year from a fantasy perspective. I never questioned his talent, more so his tackle opportunity playing within a very strong tackling front seven. He just signed a big off-season contract and I still feel his 2011 numbers were a bit inflated. With this said, I'd still have no problems grabbing him as a middle to low-end LB2. Like what you've read so far? Looking to dominate your 2012 Fantasy Football draft(s)? For $5 you can get complete access to The IDP Guru's comprehensive and exhaustive 2012 Fantasy Football Draft Guide.